Asset Advantage business updates and industry opinion. 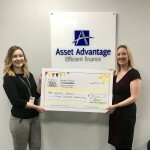 Asset Advantage have run their own Bake Off style fundraiser to raise money for their Charity of the year: Naomi House & Jacksplace. Asset Advantage has won the prestigious SME Specialist of the Year award at the annual Leasing World Awards Dinner 2017. Asset Advantage exhibit at a number of industry events during the year. Please find latest information about our participation. Come and talk to the Asset Advantage team on Stand H05 at the NACFB EXPO on the 20th June 2018 | Hall 3A - NEC about your SME client funding requirements. Sponsorship news and updates from Asset Advantage. The Asset Advantage team get ready for the start of the Basingstoke Half Marathon 2016. Asset Advantage in partnership with Destination Basingstoke is sponsoring the Basingstoke Half Marathon 2016. Local charity work and fundraising in the Basingstoke area by Asset Advantage. Philip Knight and his willing team of helpers supplied and decorated the Christmas tree for patients and visitors to enjoy. Follow us on twitter for the latest news and industry comments.